Oh Crap! The Marmots (Rock Chucks) Are Here! Oh crap! Yeah, that’s right crap. And lots of it covering the decks and crawl spaces of homeowners all over western Montana. These fuzzy little critters are cute until they wipe out your flowers, dig a dozen holes under your house and crap everywhere. So what’s the solution to all this crap? Well, you can try to cage trap the little crappers and move them but it’s illegal to dump your problems off onto someone else’s property without special permission and wildlife managers cringe at the thought of transporting potentially disease ridden rodents around the state. Sure there’s poison that is somewhat effective but that causes the animals to suffer for days as their bodies dehydrate. And there are moth balls, loud radios played under the crawl spaces and basements and if your neighbors don’t mind you firing shots across the lawn while they are drinking coffee on their porch then there is always that option. For me, instantaneous cervical dislocation by way of a 120 body grip trap seems to be the safest, most ethical and reliable way to handle it. The traps are placed in front of the entry/exit routes of the critters and when the trigger is tripped the problem ends. These traps are extremely selective and the most effective for ridding your house with rodents. Problems typically begin around mid April and the aggravation continues through mid August when they go back into sleep mode for half the year. That is unless you take matters into your own hands or call a professional – like me. 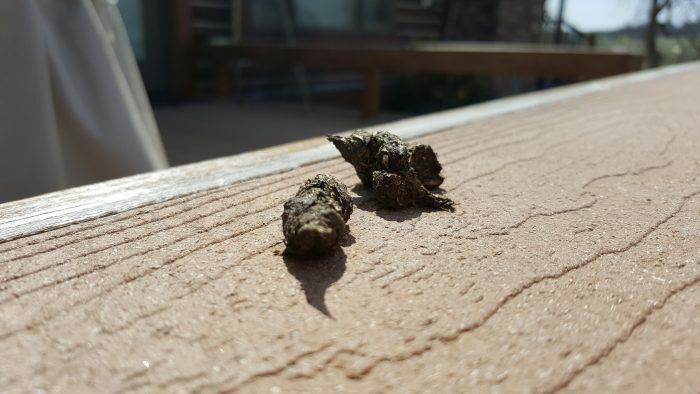 For the past 15 years I have dealt with animal damage issues like marmots that leave a mess for homeowners. I charge for animal removal and basic fixes like mesh installation and chewed molding. I have a business to run and it’s hard work catching all these critters so I have to charge a fee. Locate the crap. If it’s everywhere, so are the marmots. 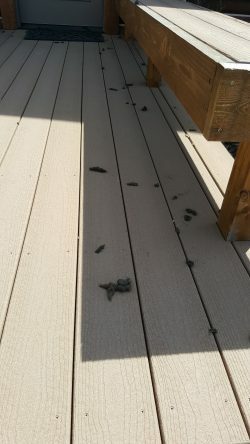 If there’s crap there will also be holes as close as right under your deck and as far away as 200 feet from your house. Set a #120 Body Gripping trap (aka: conibear) over the hole and drive a stake at an angle between the trap jaws and the springs. Don’t be tempted to use a bigger trap, the #120 is just right for a perfect neck catch. Make sure the trap is solidly staked and free from any obstacles when it fires. Also fasten the trap using wire or cable between the trap chain and something immovable to make sure something doesn’t drag the marmot away after it is caught. Be sure to feed your local birds of prey a tasty marmot or discard of them tastefully. For more trapping information visit the website of the Montana Trappers Association at www.montanatrappers.org.